a 15th position finish in the final free practice of the weekend on a drying track. Tyco Suzuki rider Josh Brookes topped the timing sheets this morning, clearly not losing any pace on track after his road racing debut in the five week break for the BSB paddock; racing in both the North West 200 and becoming the fastest ever newcomer at the Isle of Man TT last week. In a fraught end to the free practice session, riders were racing against the clock to set a dry time after being greeted with wet conditions in the beginning of the session. BSB verteran Chris Walker was the first rider to set a fast dry time on his Quattro Plant Kawasaki, but it was Australian Brookes who led for the majority of the session, only to be challenged by championship leader Alex Lowes in the final ten minutes. Walker’s team-mate Danny Buchan had his best session of the season, finishing in third position just 0.476s behind Lowes in second. Ryuichi Kiyonari seemed to continue his faster pace aboard the Samsung Honda and set the sixth fastest time of the session, 1.383s behind Brookes time of 50.132s which shot him ahead of the field, whilst Byrne was down in 15th position. 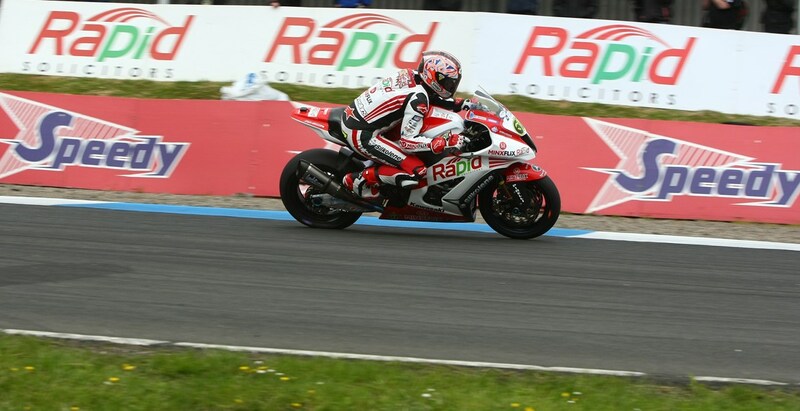 In Q1 Brookes continued to fly around Knockhill, setting the fastest time ahead of Lowes and Byrne but it was Milwaukee Yamaha who were struggling with both Josh Waters and James Ellison looking to be eliminated from qualifying. However, with a last minute push Ellison moved into the safe zone in 10th and through to Q2 whilst Waters qualified in 19th. Byrne then returned to the top of the pack in Q2 just pipping Josh Brookes to take first position in the closing minutes ahead of Alex Lowes and rookie PJ Jacobsen. In an equally dramatic session as Q1, Ellison was pushing to make it into Q3 however he was forced to settle for 13th position on the grid. The session was cut short with a minute to go following crashes from GB Moto rider Peter Hickman at Scotsman and Doodson Motorsport’s Robbin Harms at Leslies. Hickman’s team-mate, returning Dan Linfoot failed to make it through to the final qualifying and will start the race from 12th position. Kieth Farmer was the only rider to improve on his final flying lap, which boosted him up into Q3. Rapid Solisitors Kawasaki rider Shane Byrne proved unbeatable around the Scottish track and secured his second pole position in 2013, beating his own lap record from 2006 – setting a time of 48.333s. The Australian will start behind Byrne in second, with Alex Lowes completing the front row. Buildabase BMW’s John Kirkham was just 0.3s off Lowes time and narrowly missed out on a front row start at Knockhill, ahead of Samsung Honda’s Ryuichi Kiyonari who seem’s to have found a setting that works well on his bike, securing his best qualifying of 2013. PJ Jacobsen will round out the second row, ahead of James Westmoreland in 7th and Byrne’s team-mate Kieth Farmer in 8th position. To see the full grid, click here.